April | 2013 | Paul Allen Dage, etc. Notice the lower branches of this tree appear to be dead and, therefore, might be safely pruned, thus improving the overall health of the tree. Eddy, too, has aspects of his character that might be safely “pruned” to achieve a beneficial effect. For example, he’s a risk-taker, so should he try curbing this impulse, i.e., he drives too fast (while he’s drunk and stoned), and he has contempt for authority (refuses a direct order from a superior officer)? Perhaps he needs to improve his risk-benefit assessment skills. This entry was posted in Uncategorized on April 29, 2013 by Paul Dage. A big THANK YOU! 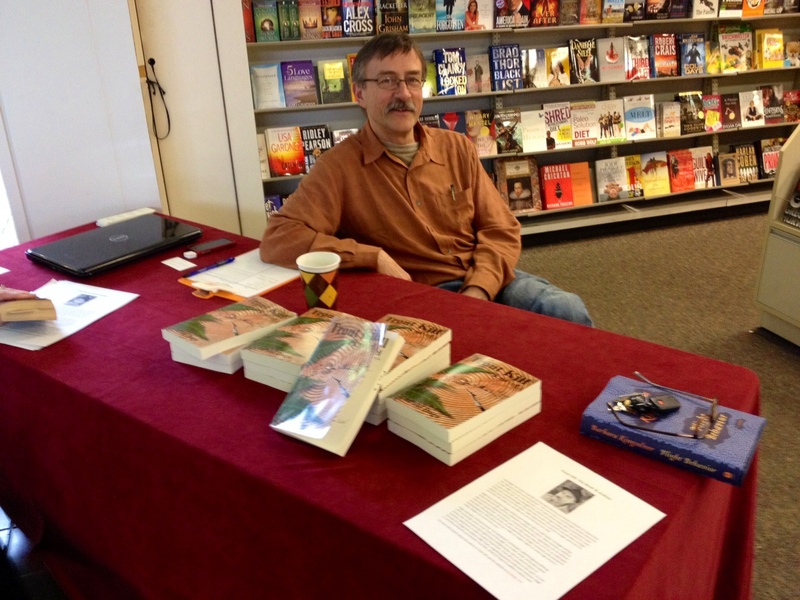 to Cutsforth’s Thriftway for hosting yesterday’s Book Fair in Canby, Oregon, and especially to Kendra Mikulec, who organized and emceed the event. I heard nothing but positives from the over twenty authors who attended and exhibited their various titles, everything from graphic stories to historical novels. I especially enjoyed visiting with former CHS students Jennifer LeRoy Huber, Targol Saedi, David Nightingale and Jason Gingerich. I hope you all enjoy Trout Kill, and be sure to pass along your thoughts to me about the story. This entry was posted in Uncategorized on April 28, 2013 by Paul Dage. In the Prologue of Trout Kill the term “god dot” appears twice: once in the first paragraph, and again a few pages later in the last paragraph. 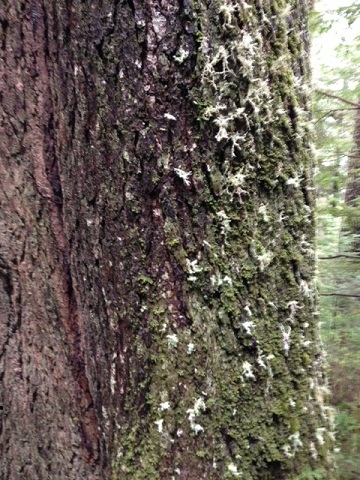 It’s a term I invented that refers to the first circle of growth in the cross section of a tree, that center-most dot. It’s metaphorical implications relate to Eddy’s search for his unknown past, namely the tragic events that occurred on the day he was born. 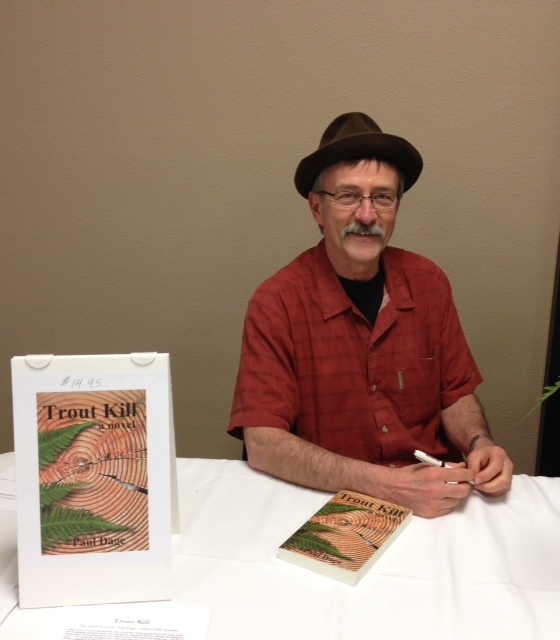 These events comprise one of the two central narratives of Trout Run, the second book of the Trout Trilogy. Eddy is 47 years old, so imagine a cross section with 47 rings. In Trout Run, Eddy seeks to know what happened to his father and mother, and to find the answers he must return in time to the events of this birth day–his god dot.. This entry was posted in Uncategorized on April 26, 2013 by Paul Dage. 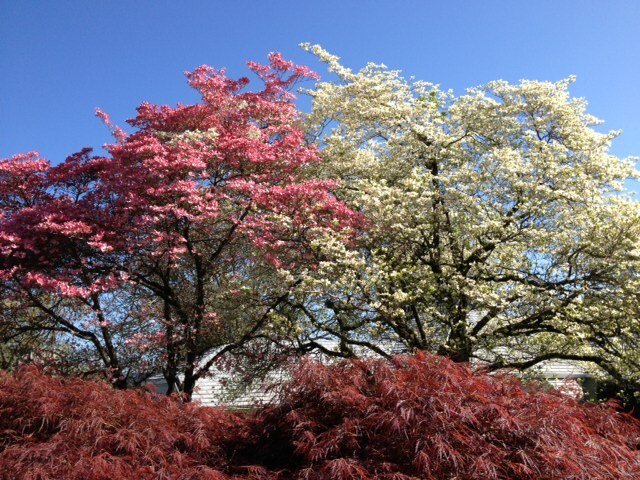 On our morning walk Deb and I came across these two dogwoods. Beautiful, right? But I couldn’t help but notice their entangled limbs, which are interlaced so thoroughly that when a big storm comes along if one tree falls it might pulled the other down with it; or, conversely, the stronger of the two may in fact help to shelter and hold the other upright. Such is the relationship between Eddy Trout and his sister Em, one of inextricable entanglement. If one falls, so too may the other; and if one stands, so too may the other. Eddy senses this, and he’s trying to do all he can to “hold his sister up.” At what expense and/or benefit, though, to himself? To Em? This sibling dynamic is one of many I explore in the second part of the trilogy, Trout Run. This entry was posted in Uncategorized on April 24, 2013 by Paul Dage. 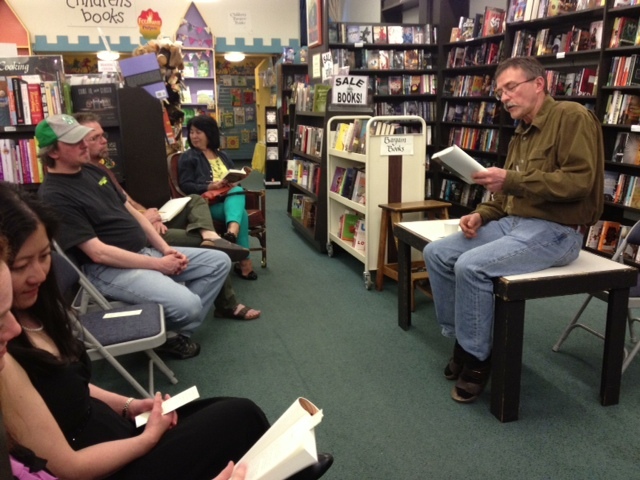 After my reading last night at Annie Bloom’s, the toughest question I faced from a member of the audience (Phil Lavine, a friend and neighbor) was this: If your father was still alive, would he read Trout Kill,and what would he think of it? I replied that my father, Emmit Willis Dage, who died about 12 years ago, would have been proud of me for writing the novel and, yes, he most definitely would have read it. The storyline in TK involves Eddy’s search for his father, who abandoned him 47 years earlier. My father never “abandoned” me, or my sister, Bev, but he was absent, both literally and figuratively, for years at a time. Bev and I knew him as a big-hearted man who drank, smoked, cussed, philandered and, eventually, divorced our mother, Helen, married a woman named Rose, divorced her and then remarried Helen. My mother, despite very limited financial resources, raised me and Bev mostly by herself. One of the biggest challenges I’ve faced in writing this trilogy (Trout Kill, Trout Run and Trout Love) is figuring how to fictionalize the events that land very close to home, and the characters who participate in those events. Thank you, Phil, for asking that question. This entry was posted in Uncategorized on April 23, 2013 by Paul Dage. Hope to see you all tonight at my Trout Kill reading, 7:00pm at Annie’s. Bring a friend! This entry was posted in Uncategorized on April 22, 2013 by Paul Dage. Last night Deb and I saw the Steve Earle concert at Music Millennium in Portland. Way cool, dude and dudettes! You can check out “The Man” here, from a concert several years ago. If you haven’t already, and you like his genre–alt-country/folk/rock–make a Steve Earle “station” on Pandora! And now that I have your attention, please consider attending my Trout Kill reading at Annie Bloom’s Monday, April 22, at 7:00pm. See you there! This entry was posted in Uncategorized on April 21, 2013 by Paul Dage. So, you’ve never been to an author reading? Really? Where have you been your entire life? For the uninitiated–and for you veterans, too, if you’d like to brush up a bit–here’s a guide by Nicola Griffith on what to possibly expect when (if?) 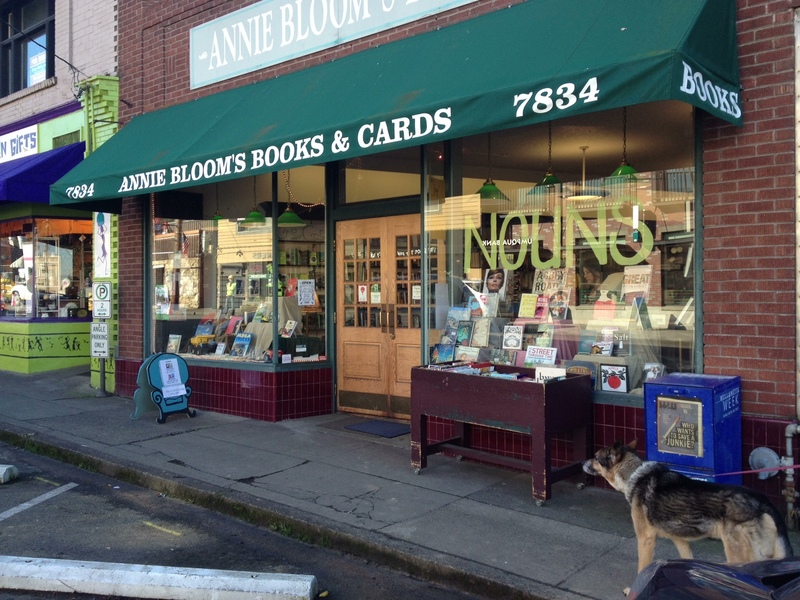 you attend my reading of Trout Kill at Annie Bloom’s Bookstore Monday, April 22, 7:00pm. This entry was posted in Uncategorized on April 18, 2013 by Paul Dage. The Myth: If you’re lost in the woods without a compass, look for moss – it shuns the sun, and therefore only grows on the north side of trees. 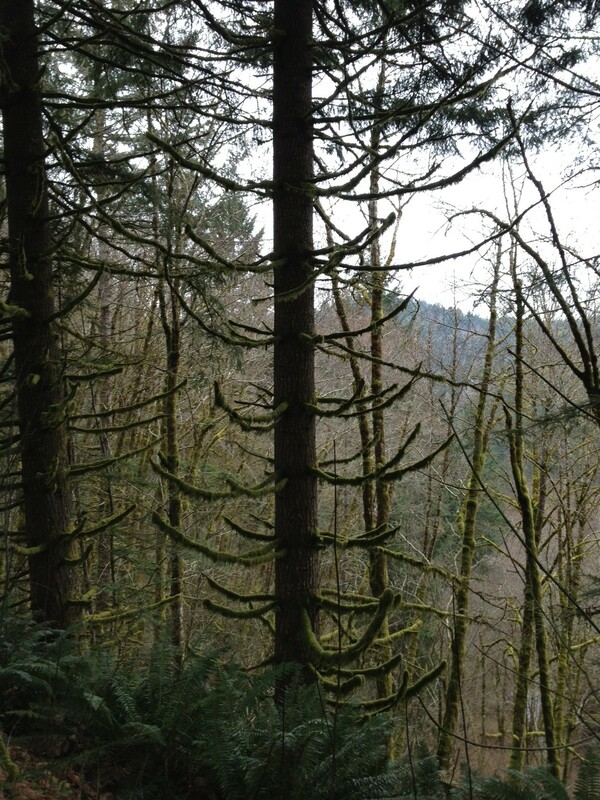 The Myth Busted: Mosses will grow on the north, south, west and east of trees (and, indeed, buildings), wherever there is enough moisture to sustain them – and that depends on various factors, such as prevailing winds, and not exclusively on shade. 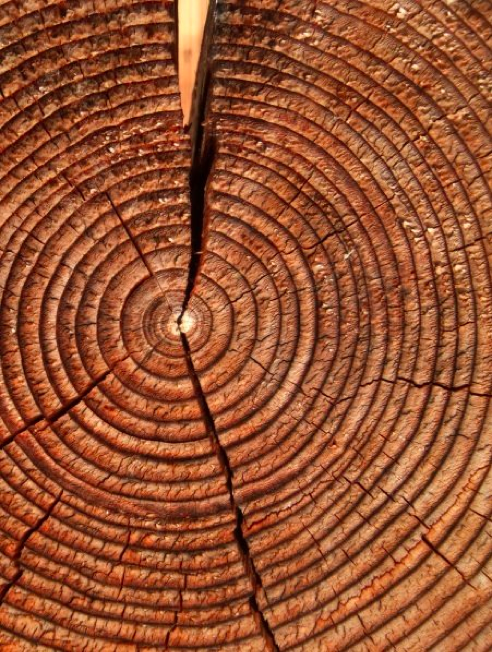 Besides, if the south side of the tree you’re looking at happens to be partly shaded – perhaps by another tree, this being, after all, a wood – moss will colonize it readily. This entry was posted in Uncategorized on April 15, 2013 by Paul Dage. One of Eddy’s character “flaws” is he takes unnecessary risks. Perhaps he enjoys the resulting adrenaline rush. In Chapter One of Trout Kill, for example, he speeds around a corner and hits a deer. 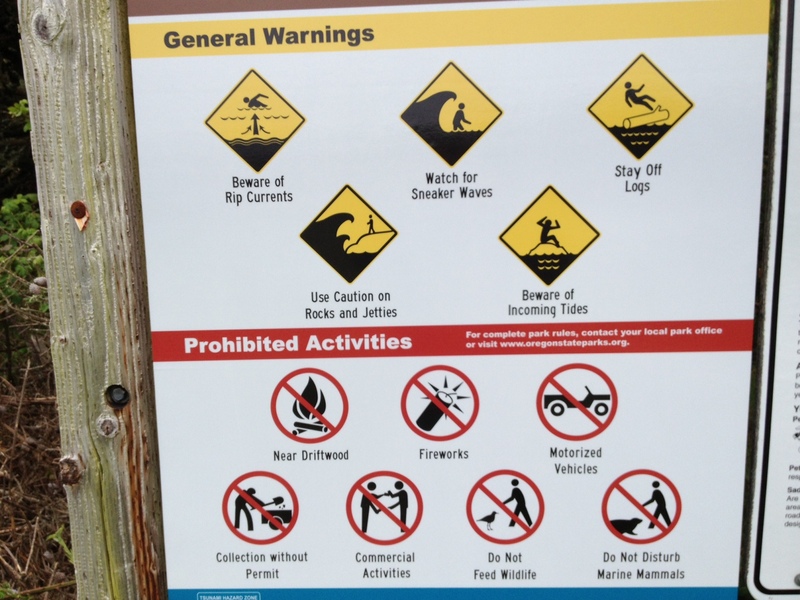 Would he take seriously the warnings on this sign at the state park at Nehalem Bay, Oregon? Many readers say TK is “suspenseful,” and what I think they may mean is they just can’t predict what Eddy’s gonna do. This entry was posted in Uncategorized on April 12, 2013 by Paul Dage.